Easy to put together! Looks great! "Restyle your bedroom decor with the Anya Platform Bed. 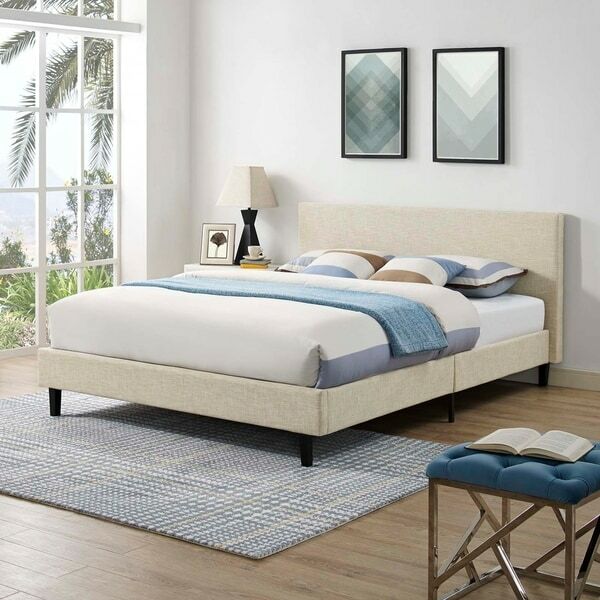 Designed with a chic avant-garde look, Anya comes with an upholstered polyester fabric base and headboard, solid wood legs, and a slatted wood support system that eliminates the need for a box spring. Complete with a reinforced center beam with supporting legs for maximum stability, Anya accommodates the various mattress types on the market such as memory foam, spring, latex and hybrid. A sleek and striking centerpiece to your bedroom, Anya is a quality modern bed poised to thoroughly transform your space. Weight capacity up to 1300 lbs. Mattress Not Included. This product will be shipped using Threshold delivery. The product will be delivered to your door or the nearest ground-level entrance of your residence. Signature required upon delivery. Dimensions 86.0 In. X 66.0 In. X 36.5 In. I bought this platform bed for my memory foam mattress. It was fairly easy to assemble, but it did have a lot of parts. Don’t expect to put it together with the tools you were given, you will need your own. I feel like it’s a great buy. But you should make note, the backside of the headboard is not covered with the fabric so it needs to go against the wall. This bed was easy to assemble and looks great once together. It's sturdy and I like that it does not require a box spring. Works great with a memory foam mattress. I've never put anything together before but the directions made it so easy to build this beautiful platform bed! It looks just like the picture and it supports my mattress well. It looks amazing in my room and the quality of it is great. I bought it for my teenage daughter's room in the teal color, which looks exactly as pictured. 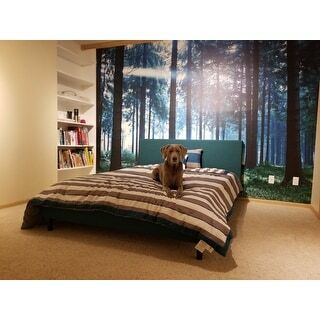 I was even able to buy bedding on Overstock before the bed arrived that matched almost exactly, just by the photos. The bed was fairly easy to assemble, and felt very solid once complete. My daughter loves it, and I'm satisfied as well. Great bed for the money. Looks pretty good for the price. Sent to my granddaughter for her spare bedroom, for me...lol. They had some trouble putting it together, looks fine to me. I purchased The Madison-Park-Abrego-Coral-6-piece-Cotton-Sateen-Coverlet-Set and a coordinating blanket, from Overstock of course, for it and it was so inviting. My granddaughter added a few things and it's just lovely. I think I may have spent abt $600. On the bed, mattress and bedding. I highly recommend it, even with the difficulty of putting it together...of course that may have been the kids' inexperience. We have had this queen frame for a little over 6 months - while the fabric and look of the bed is great, we have already had a couple of slats break and due to the design of the slats, it creates a 'bump' in the middle of the bed. We have a memory foam mattress and you can definitely feel the division piece in the middle of the bed. This frame may be better suited for a guest room and not for nightly use. Easy to put together, my husband and I had it together in an hour. The size is perfect for our attic room. We love that we did'nt need a box spring. We have a 16' mattress and our guest sleep like babies. I love it! It’s the first time I buy something here! Delivery was fast and the bed looks great in my son’s bedroom. I’m very happy! I’m planning to buy another one. They price was great compared to expensive beds...this one looks the same as the expensive ones. I highly recommend this bed. Very satisfied with my purchase. This bed took my dad and I about an hour to assemble. I love not having to buy a box spring and it looks great in my room. It sits lower to the ground, as I expected, but I would recommend to someone that wants an affordable bed. It's not as sturdy as I was hoping for, but it's not too bad. It seems like the sizing for the Queen might be a bit off; I appear to have a lot of empty spaces throughout the bedframe. None of it's a deal breaker though, and the bed was very affordable. I'm looking for a new bed now (got this in July) but that's more for personal preference reasons than anything else. The bed itself has held up well. The slats are not very stable. We spent the money and put plywood over them for stability. Like the frame color. Sturdy and low-profile. The wooden slats make a box spring unnecessary (and indeed, would actually ruin things by taking vertical space awayfrom the headboard). The bed comes in a very easy to ship package, almost seeming unrealistic at first. But yes, the whole bed IS in there. The only problem I have with the bed itself is that the wood beams make creaking, cracking-like noises when you’re first “breaking in” the bed. After awhile the sounds go away, but it is still very worrisome at first. Love this bed...Shipped quickly...Everything was there...I did pay a friend to assemble it and it took him about 75 minutes...Looks AMAZING! Very sturdy and of good quality. This is an incredible bed. Sturdy frame and easy to put together. The finish work on the fabric is very good and the stitching is done well. The color is awesome and matches everything. "Also, does the bed seem to be pretty sturdy?" "What is the distance between slats? Thank you!" "Can i put also spring box with mattress?" Yes, you can use a box spring, but it is not necessary and it might be too high for the headboard. "Does this require box spring? or can the mattress be placed directly on the wooden slats. Product details mentions that box spring is required, hence checking." This does not require a box spring. No, it doesn't need a box spring. 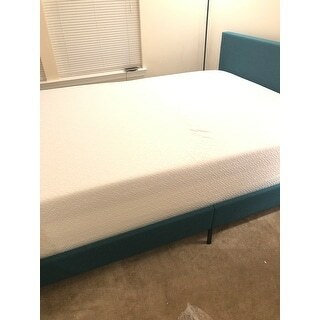 It has slats or supports, that hold the mattress just fine. "Would you say that an under the bed storage bin fits under this bed? And how high is the side bar from the ground?" The floor to the underside of the bed is 5". I purchased this bed for my son and future daughter in law who are getting married in 2 weeks. 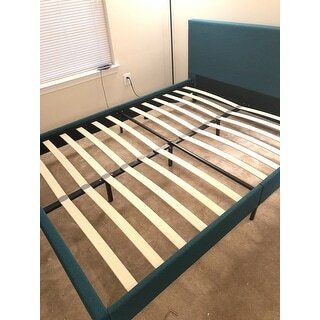 Good price, wood legs, and enough slats so you don't need a box spring.